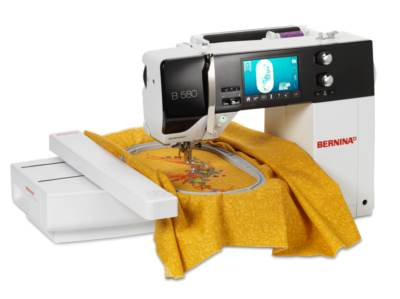 The 580 E is a sewing, quilting and embroidery machine. It puts a wide range of stitches at your disposal - 838 stitches in all, and all stitches can be sewn up to a width of 9mm, which is particularly attractive for embellishment. In addition, 7 alphabets for sewing and 7 alphabets for embroidery are at your fingertips. What’s more, the 100 embroidery designs can be accessed in a separate embroidery mode and adapted on the touchscreen: rotating, mirroring, sizing up or down or altering the stitch pattern are quickly accomplished, thanks to the 580’s intuitive operation. Using the memory function, it’s a cinch to permanently save your customized stitches and embroidery designs. 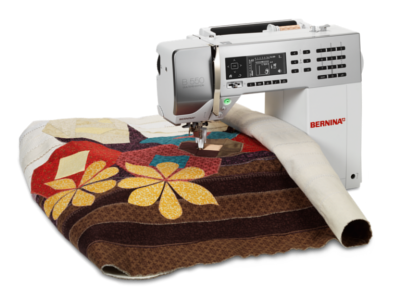 Plus, the included BERNINA Stitch Regulator (BSR), which ensures even stitches at any speed, makes the 580 E ideal for quilting. 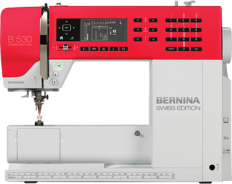 The 530 Swiss Edition is a sewing and quilting machine with an eye-catching red panel. It boasts an extensive repertoire of utility and decorative stitches and the stitch length and width, as well as 11 different needle positions, can be freely modified and saved temporarily or permanently to the 530’s memory. The control panel is clearly laid out, enabling quick access to all stitch patterns and settings, including reverse and mirror function, manual or automatic buttonhole and much more.